You have a company in play. There’s a lot of money at stake here. People are watching. And you’re under the gun to make it work. A few months from now you’ll be the hero or the guy they hang. 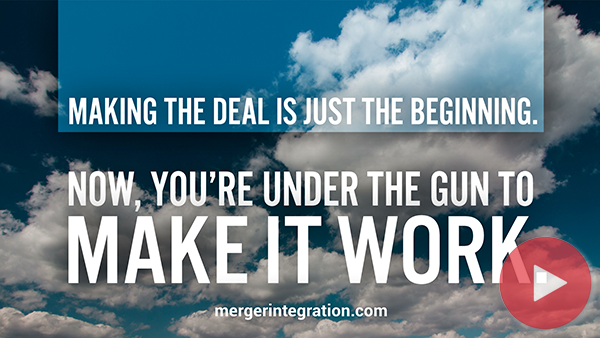 Perhaps you think the integration will be one of the most complex projects you have ever tackled. And you are worried because you are already stretched pretty thin and short on resources. • Is the integration budget too tight? • Are deadlines too aggressive? • How long will it take integrate systems? • Do the executive teams share the same expectations?